As the summer begins, you may be looking for fun new activities to do outside. Have you ever tried paddle boarding? Stand up paddle boarding (SUP) is a summer activity for those who enjoy the outdoors. Part surfing and part kayaking, paddle boarding is a fun workout for everyone. 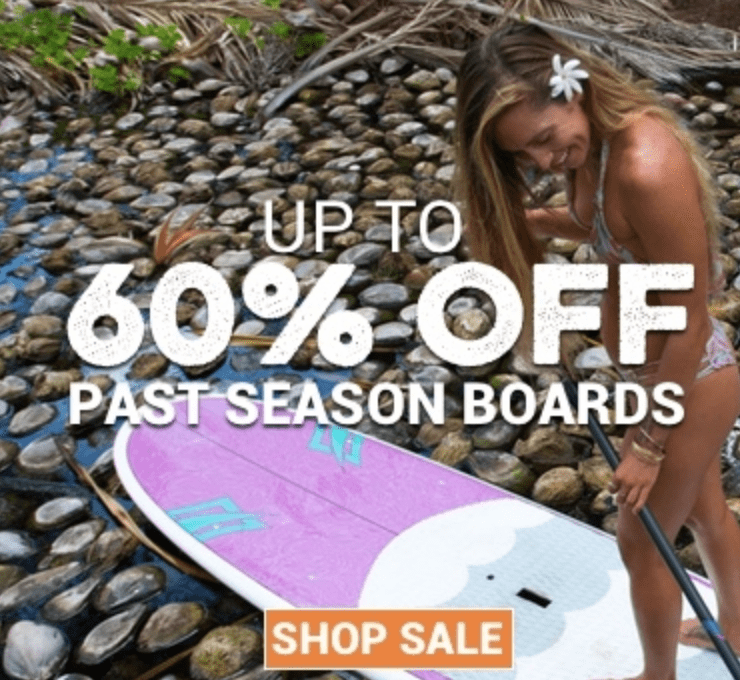 One of the fastest growing sports in the world, stand up paddleboarding is sure to be a popular trend this upcoming season. The paddle board is essentially an oversized surfboard that participants balance themselves upon. There are different iterations of the board depending on your skill level and intent of use. Before purchasing, you should be aware of these various types of boards. 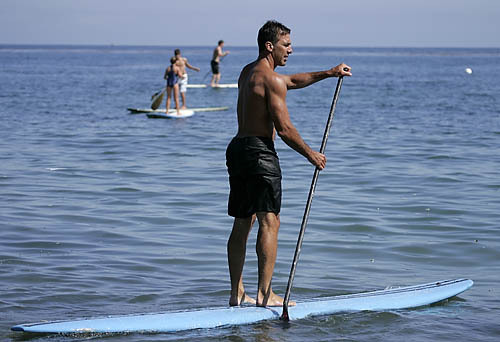 For instance, the all-around SUP board is great for beginners and is the most common shape for a paddle board. 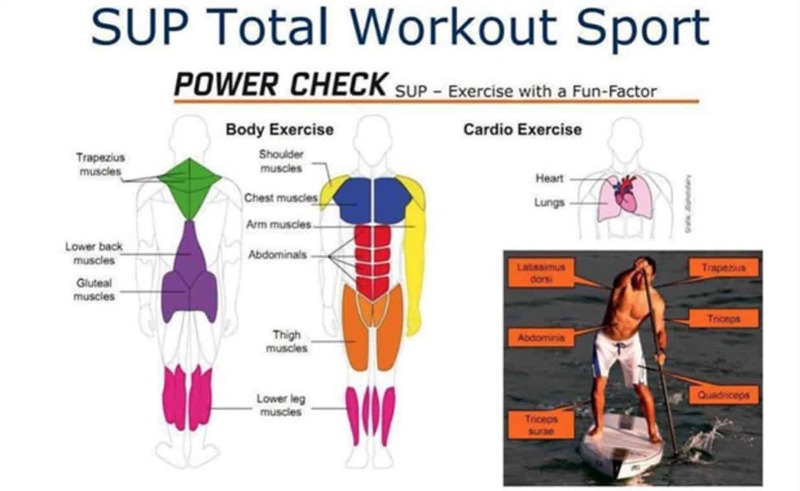 The surf SUP board is aimed toward intermediate to advanced level boarders. This board allows the user to maneuver more quickly, but it is much easier to fall off. The tourist SUP board is made for those that want a greater workout while they paddle board, and is designed to be used in an environment that is conducive to calm tides and flat water. The race SUPs have extra strength and width, which allows for speed and better glide efficiency than other boards. The fishing SUPs are marketed toward those that want to fish but do not want to invest in a boat or kayak. Fishing SUPs have the most volume. This way you are dry and out of the water. Lastly, yoga SUPs are constructed for stability and are designed to be used on flat-water, low-tide areas. Whenever considering this activity, be aware that the equipment is relatively expensive, and the gear needed will cost you in excess of a couple hundred dollars. You are going to want to be sure you purchase the right size paddle board. As a rule, add about nine to ten inches onto your height. For example, if you are 5’11 (71 inches), you should purchase a paddleboard that is around 81 inches in length. On a positive note, while the paddle board itself is quite large, there are inflatable variants that will save you valuable storage space. The paddles are often adjustable too to be able to fit whatever size is needed. When adjusting your paddle, you’ll want to adjust it so that it is a few inches taller than you. Stand the paddle vertically beside you. You want the paddle to reach above your head; almost a full arm’s length above you. Getting the appropriate paddle length is important because If the paddle is too short, it will make it difficult to reach the water, therefore making it harder to keep your balance. On the contrary, if the paddle is too long, it will be difficult to handle when moving from side to side. Generally, whatever size is comfortable for you will work best. By all accounts, paddle boarding can be difficult, especially if you are a beginner. The first step is mounting your board. Stand in shallow water next to your board. Second, place the paddle horizontally over the board. Next, place one knee on the board while holding both sides of it, so that it is stable. Now, attempt to find the “sweet spot” on the board and place your weight there – usually found towards the center of the board. This will allow you to keep your balance on the board while slowly mounting your other leg. If done correctly, you should now be centered on the board in the kneeling position. Finally, take a few strokes with the paddle to get a feel for your board and the tide. If you are struggling to stand up at first, an alternative technique is to try kneeling or laying on your stomach while trying to keep your balance. Thankfully, navigation is easy to learn. When attempting to steer, much like you would with a paddle boat, row using the paddle, alternating from side to side every few strokes to stay in a straight line. If you want to turn, use the paddle only on one side – the alternative side of the direction you would like to turn. There are a variety of health benefits to stand up paddle boarding. One of the hardest aspects of the activity is keeping your balance on the board. The leg strength required to do this is tremendous, and it will keep your lower-body lean and toned. However, paddleboarding is not just for your lower body. It is a full-body workout, requiring a lot of upper-body strength, too. The arms, shoulders, and back muscles are all used to stay steady on the board, as well as to propagate through the water. An inclusive feature of paddle boarding is its low impact nature. This makes it suitable for those whom are older or are rehabilitating from an injury, as it is easy on ligaments and joints. Paddle boarding also reduces stress. There is something about being able to connect with nature that calms the mind. The water helps to soothe the body and reduce achiness. In addition, paddle boarding is a wonderful cardio workout. As you paddle, your heart-rate is increased. This not only will help to keep your heart healthy, but it may also aid in weight loss, too! On a typical day of paddle boarding, you can expect to burn 600-700 calories per hour. Your endurance will also be increased due to this activity. Additionally, it does not hurt that you will be receiving health benefits from the sun, too. Eventually, you will start to gain better balance, reduce stress, and increase muscle strength, all from doing an exercise that is fun and relaxing. Is Paddle Boarding Right For You? Due to the financial investment needed to start paddle boarding, it may have made you wonder if it is truly right for you. There are many places that allow people to rent paddle boards for the day – and often costing less than $100. If you are on the fence about purchasing the equipment, this may be a good option at first. If you want an outdoor activity that is fun and full of health benefits, then stand up paddle boarding is for you! Thank you for visiting SUP Boards Review, please be sure to check out some of our other blogs and reviews here. If you would like me to review your board and do a blog on it, please reach out to me at [email protected].